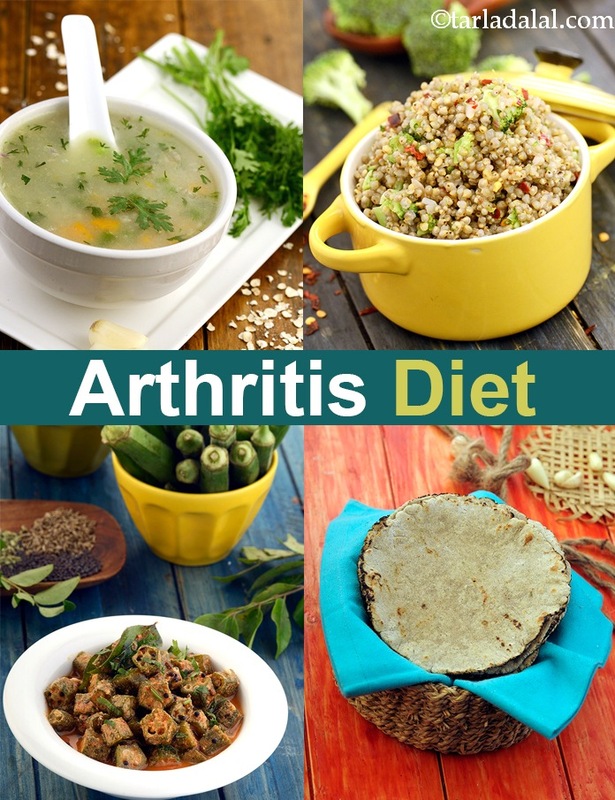 Arthritis is a disease in which the joints of the body have pain, inflammation and stiffness. Osteoarthritis: This is developed due to wear and tear or overuse of joints usually due to age or obesity. The small and large joints are affected symmetrically like both hands, feet, wrists or elbows. There is pain but not much swelling in the joints. Rheumatoid Arthritis: This is an auto immune disease in which the body’s own immune system attacks the joints of the body. The weight bearing joints like the hip, knee or the spine as well neck, small finger joint, thumb and toe are affected. It usually begins on one side of the body and gradually affects the other side and is accompanied with swelling in these joints. In either case the dietary focus is to concentrate on foods that reduce inflammation and relives pain. Here are a few anti-inflammatory foods which you must befriend to control pain and swelling. • Rely on High in Omega 3 Fatty Acids : Omega-3 fatty acids found in Walnuts, Chia Seeds and Flax Seeds are great sources of omega-3 fatty acids which help reduce the inflammation to a great extent. You can name them super foods. How much to eat: 2 to 3 tablespoons of seeds and 4 to 5 walnuts daily. • Befriend antioxidant rich fruits and vegetables: Lutein, vitamin A and sulfurophane in Broccoli, bromelain in Pineapple, papain in Papaya, Vitamin C in Capsicum and fruits like Oranges, Grapefruit. Strawberry etc., Vitamin A and Vitamin E in Spinach (Palak), quercetin in Kale and anthocyanins in Cherries are all the fruits and veggies that benefits to ease the arthritic pain. Bear in mind that the deeper the colour of fruits and vegetables, the higher amount of Antioxidant it carries. How much to eat: At least 2 to 3 serving of fruits and 4 to 5 servings of vegetables. • Go grains : Eating a lot of whole grains than refined foods will toss in High Fiber to your diet and help maintain weight. Remember that obesity is one the causes for osteoarthritis. Include Oats, Buckwheat, Barley, Jowar, Bajra and Quinoa in your diet. How much to eat: Aim for 3 to 4 servings daily. • Reach out only for healthy Fats: Firstly chalk out the fried foods completely. Amongst the fats, opt for olive oil or safflower oil as much as possible. These are also high in omega-3 fatty acids and are known to protect the heart. How much to eat: Not more than 3 to 4 teaspoons a day. • Befriend Sulphur rich foods : Sulphur rich foods like Cabbage, Brussels Sprouts and Cauliflower are full of sulfurophane compounds which help to reduce inflammation of joints. How much to eat : Have at least one of these cruciferous veggie daily in the form you enjoy. • Boost your intake of beans: Whole beans like Rajma and chick peas (kabuli chana) are a good source of fiber and other nutrients like Magnesium, Iron, Zinc, Potassium, folic acid which together work to boost immune system. How much to eat: 2 to 3 times a week. • Shop for healthy spices: Do not forget to add spices like turmeric powder and garlic to your cart. These are one of the highest inflammatory fighters. How much to eat: Fell free to add as much as you can handle.